Hieromonk Parthenios Partheniades was a member of the Kollyvades movement, and when he was forced to leave Mount Athos he went to the Monastery of the Annunciation in Icarus. In 1798 Parthenios arrived at the island of Patmos, accompanied by several other monks, and the Meadow of Koutroulis, named after the original proprietor and located on the north side of the island to the south of Cape Sardella, was ceded to him by its owners on the condition that he pay them 25 piastres a year. With builders from Samos he established a small monastery known as the Meadow of Monks. Thus he became the first proprietor of the dependency and for that reason it is called the Kathisma of Parthenios. 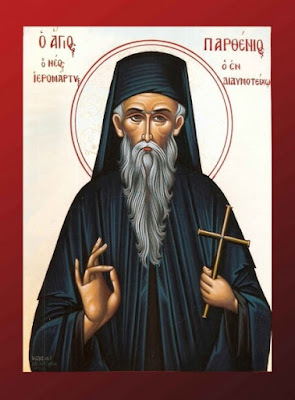 Needing further resources to complete construction of the monastery, Parthenios went to Thrace to raise the funds. In Thrace he worked as a priest and one day he advised a young Christian woman how to flee a relationship she had with a Muslim Turk. When this Muslim learned of it, he became enraged and killed Parthenios on the 5th of March in 1805.